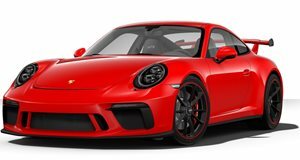 Upon our first impression, we thought that German tuner Magnat drew its inspiration for their tuned Porsche 911 GT3 from a storm trooper from the ice planet Hoth in Star Wars. So it&apos;s only fitting enough they dubbed their upgraded package the &apos;Snowmobile&apos;. Some of the features include the obvious black stripe that extends from the hood until the trunk and decals above the side sills. The interior is fitted with elegant Alcantara leather and a 2,100W sound system which contains the Magnat Black Core 5 channel amp. The outside is topped with 19-inch OZ Ultraleggera HLT CT rims wrapped in Yokohama Advan Sport tires. Under the hood, the 911 GT3 produces an output of 462hp and 332 lb-ft of torque with a top speed of a “relaxing” 197 mph. Magnat also donned its ECU remap program along with a sports exhaust system and suction tubes for an improved ride and overall performance. No word on pricing for the package.